You’re super-excited about a big change you want to create in your life. But after struggling with it for a few weeks (or even just days), it all becomes a grind. What was supposed to be an exciting opportunity to grow has quickly become a source of dread, frustration, and self-doubt. Why can’t I ever stick to my goals? Why do I always do this? What’s wrong with me? And then you quit. Again and again… and again. Each time feeling a little more discouraged than the last. But getting started with a new habit doesn’t have to be this hard. In fact, it can be quite easy (and even a lot of fun). The biggest mistake people make when they get started with a new habit is that they aim for a goal that is too hard. We tend to want results immediately and, as a result, we end up asking too much of ourselves too soon. It doesn’t matter if we haven’t been exercising much the last couple of months. We still expect to hit the gym four times a week (starting Monday). And while audacious goals can be inspiring they can also become a huge roadblock in the beginning. I suggest we take another approach. The domino effect is powerful. But the only way to get it moving is to start with a domino that’s small enough that we can actually knock it over. What we usually do is start at the other end. We walk right past the small dominoes and start wrestling the biggest one right away. And when the damn thing doesn’t budge, we get discouraged (or maybe even injured or burned out) and quit. In my experience, it’s a much better approach to start with a domino that’s so small it’s nearly effortless to knock down. Meditate for just one minute. Add one vegetable to just one of your meals. Do two pushups every day. Read one page in your book every night. Remove just one piece of clutter from your home every day. Once you’ve got these tiny pieces in place, focus all your energy on becoming a master domino player. All you need to worry about is showing up and knocking down your tiny dominoes. Every single day. If you can do that, you’ll eventually knock down the biggest domino at the end of the row. And it will most likely happen much faster than you think. The reason this approach is so effective is that it allows you to make progress without depleting your willpower muscle. Instead of getting stuck and frustrated, you get to experience a series of small wins. 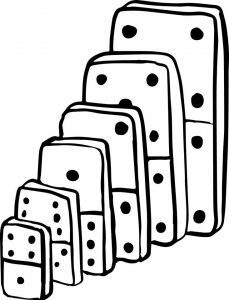 Each domino you knock over proves that you are in charge of your behavior and that you can create the change you want in your life. From this empowered state, it gets much easier to stick to your habits long enough that they become a natural part of what you do every day. And once you’re in that place, it’s only a matter of time before you start knocking over your biggest dominoes.